Sign up for Broadjam today to follow Magic 7, and be notified when they upload new stuff or update their news! 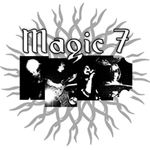 Live video from Magic 7s show at The Frequency. Video shot and edited by Greg Martin.